. William R. Polkinghorn, Joel S. Parker, Man X. Lee, et al. Androgen Receptor Signaling Regulates DNA Repair in Prostate Cancers. Cancer Discovery, 2013, 3(11):1245-53.
. Nicola J. Clegg, John Wongvipat, James D. Joseph, et al. 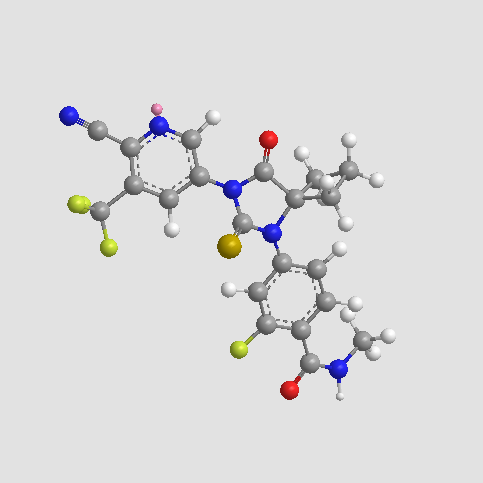 ARN-509: A Novel Antiandrogen for Prostate Cancer Treatment. Therapeutics, Targets & Chemical Biology, 2012, 72(6): 1494-1503.
. Shuyuan Yeh and Chawnshang Chang. Cloning and characterization of a specific coactivator, ARA70, for the androgen receptor in human prostate cells. Proc. Natl. Acad. Sci., 1996, 93: 5517-5521.
. James D. Joseph, Nhin Lu, Jing Qian, et al. A Clinically Relevant Androgen Receptor Mutation Confers Resistance to Second-Generation Antiandrogens Enzalutamide and ARN-509. Cancer Discovery, 2013, 3(9):1020-9.